University of Chicago Press, 9780226240077, 200pp. In this second edition, Saller adds new chapters, on the dangers of allegiance to outdated grammar and style rules and on ways to stay current in language and technology. She expands her advice for writers on formatting manuscripts for publication, on self-editing, and on how not to be “difficult.” Saller’s own gaffes provide firsthand (and sometimes humorous) examples of exactly what not to do. The revised content reflects today’s publishing practices while retaining the self-deprecating tone and sharp humor that helped make the first edition so popular. Saller maintains that through carefulness, transparency, and flexibility, editors can build trust and cooperation with writers. The Subversive Copy Editor brings a refreshingly levelheaded approach to the classic battle between writers and editors. This sage advice will prove useful and entertaining to anyone charged with the sometimes perilous task of improving the writing of others. 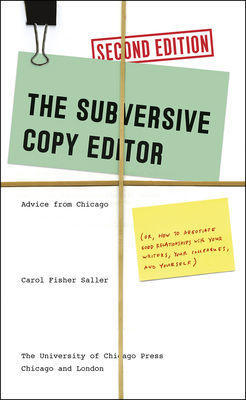 "If you admired—even loved—the first Subversive Copy Editor, you will perforce admire and love the second edition."